Vue de monde, at level 55 of Melbourne’s iconic Rialto building, is one of the best fine dining restaurant in Melbourne, as well as in Australia. It's expensive, spectacular and the mod-Oz crowning glory of chef Shannon Bennett’s predominantly French empire, but above all, it’s a pain in the arse to get into. 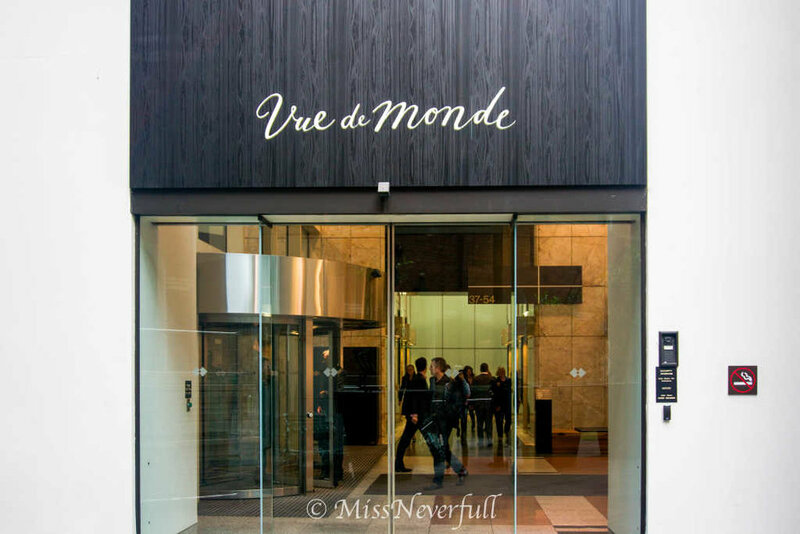 Once step into the Rialto building, you can see the reception of Vue de Monde at the lobby. The lift on the left hand side takes you directly to 55F. The space is divided into a bar and a main dining room. You can enjoy the stunning view of the skyline of Melbourne and sunset at the bar (if you cannot get into the main dining room). Before entering Vue de monde, the main dining area, you will walk through the wine cellar . The decor of VDM is mostly black, very simple but modern. You can enjoy the breathtaking view of the city from ceiling-to-floor window. Amuse bouche consists of 7 different snacks, each was served on a real stone - very special and appetizing. The lunch menu is priced at $200 for 5 courses, each additional courses cost $10, guests can choose up to $250 for 10 courses. I picked the medium 7 courses menu. The menu changes daily. The first course was a deep-fired Barramundi collar with lemon myrtle. It has a very mouthwatering fried smell. No cutleries needed for this course, yes you need to use your hands. The skin of the collar was very crispy and nicely coated with a layer of lemon myrtle. The center of the collar was incredibly juicy and tender. Then i was presented with an entire head of the Barramundi i just had. After the collar part, next will be served with the Barramundi cheek. Although i have had Barramundi a lot before, but It was my first time to have Barramundi cheek. It was very enjoyable to see the handsome manager cut and take out the chef from the thin layer of skin. Barramundi cheek with Gascony butter was served on a bed of lettuce. The cheek was succulent and naturally sweet. The Kingfish itself has a lightly seared outer layer, the center part was still in my favorite sashimi-texture. The oyster sauce was very umami and works perfectly with the kingfish. The side of some green leek and black cabbage well balanced with the entire dish. The server changed the cutleries as usual, but the appearance of the 'wooden man' made me even curious about next course. I was firstly presented with a bowl of fresh edible flowers. But i knew it wouldn't be so simple. After serving the hydrated ice, the flowers became crispy. The wooden man was used to grind the flowers. After i grinding the flowers by myself, which was named 'wood sorrel', the cucumber sorbet was served. The combination was very refreshing. The butter was freshly crafted in front of me. A hot stone came with the bread basker which keeps the bread warm. It is really hard to resist such a huge salted egg yolk. It was very high in flavor and wonderfully works with the truffle sauce on the bottom. The pear on the top keeps a nice balance. One of my favorite dishes at VDM. It was the best season to have marron, which was largely produced in the ocean near Ausralia. I was told to swipe the marron with the born butter with my hands. The marron itself was large in size, very juicy, tender and sweet. The marron sandwich on the side was very flavorful as well. The leek was nicely rolled and wrapped with squid, side with ice plant and goat milk rock. The goat milk rock tastes like shaved ice, a bit savory flavor from the cheese itself. Very interesting but refreshing dish. It was my first time heard about Munthari berry, which was only grow in Australia. The Munthari berries was marinated in beetroot juice thus has an appealing pink color. The texture was quite different from other berries, it was crispy and popping in my mouth. Next was the pre-dessert, a lovely strawberry ice-cream wrapped with rhubarb jelly, on the bed on mint powder. It was flavorful and refreshing. The main dessert was Vue de Monde's most famous Chocolate soufflé. Once i talked with one of my foodie friend that my favorite soufflé was RyuGin's Sake Souffle, and he told me VDM's was his favorite. The chocolate soufflé was indeed die-for. It was hot and airily, and has a very deep chocolate flavor. I was such an indulgence but absolutely worth the calories - the best chocolate soufflé ever. Petit fours consists of a rum jelly in a shape of 'one-dollar penny', a chocolate mousse coated with coconut flakes and raspberry jam, plum ice cream, strawberry meringue stick and a caramel chocolate. I spent about 4 hours dining at VDM, probably the longest lunch i had so far. It was very enjoyable, each dish was unique and impressive. I especially love the duck yolk, Marron and chocolate soufflé, while the rest of the dishes were great as well. It was the most impressive meal during my Australia trip Apr.2015.